THE GENTLE STORM, featuring the talents of Arjen Lucassen (AYREON, STAR ONE, GUILT MACHINE) & Anneke van Giersbergen (THE GATHERING, DEVIN TOWNSEND PROJECT), released their debut album The Diary at the end of March to much critical acclaim, and following a fantastic launch show in Amsterdam, Anneke is now on the road with a specially selected band to present the songs live. To celebrate the upcoming dates that begin April 22nd, they are now pleased to launch a live video for the track "The Storm", which was filmed at the bands Hedon Zwolle show on the April 3rd. Captured by the band themselves on GoPro cameras, and featuring sound taken directly from the mixing desk, you can view the video right HERE. 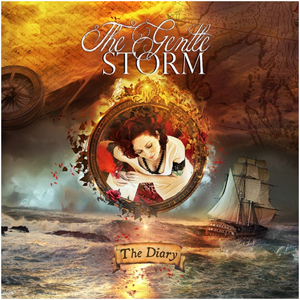 "Wow... what a live band THE GENTLE STORM has become! Since I'm not playing in the band I can safely brag about them without sounding arrogant :-) Really impressive, so tight and such great stage presence... I'm proud of each and every one of them. I could only dream of our songs being represented live like this. Well done!"